My first proper beauty post of the year! I’ve been in a bit of a slump with beauty products recently. I’ve been feeling really down on myself appearance-wise, I absolutely hate my hair at the moment and the majority of my clothes are now far too big for me. I honestly just haven’t had any motivation to try and make myself look nice as no matter what I do, I feel like I look terrible. I’m planning to change this soon with a bit of an overhaul of my look. I’m not yet sure what I’m going to do but I’m hoping it’ll end up making me feel a lot better! And I imagine there’ll be a little post on it if I manage to do it successfully. Anyway, enough of the depressing babbling. 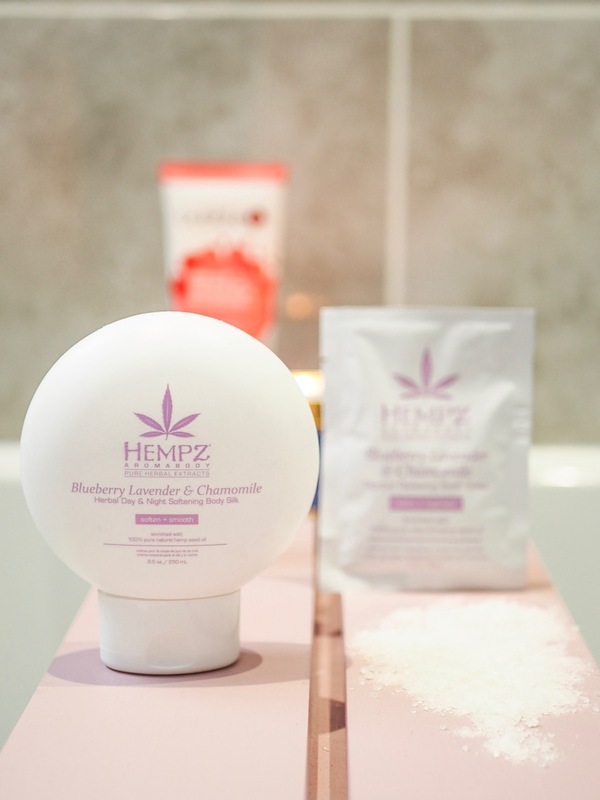 Todays post is a look and review into some products from the Hempz Blueberry, Lavender and Chamomile range! 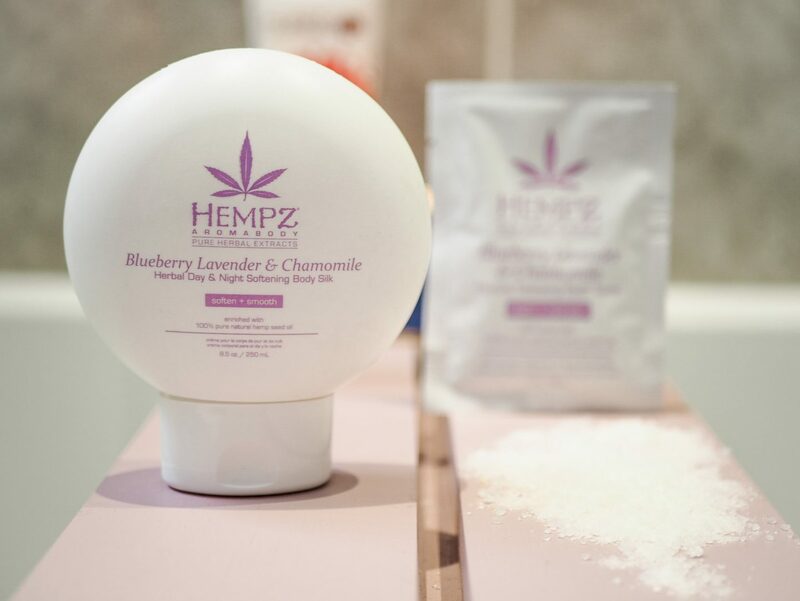 To begin with, Hempz are a cruelty-free, gluten free and paraben free brand with lots of vegan products on offer. Definitely a perfect brand to take a look at if you’re doing veganuary! Their products are also enriched with 100% organic hemp seed oil giving them healing and nourishing properties but of course do not contain any THC. I couldn’t actually find the information on their website but on both of these products, it says they are 100% vegan. Firstly, I really love the bottle. I’m a huge sucker for packaging when it comes to products and this one has for sure lured me in. Other than the aesthetic individuality of it, I much prefer squeezy bottles to pots personally as I feel like they can be a bit less messy so this is ideal for me. When it comes to the scent, I was expecting it to be much more overwhelming in the lavender department but I’d definitely say the blueberry is the most prominent thing. The lavender is still very much present in the scent, though. Chamomile is never usually very heavily scented, more just used for it’s calming properties. The aroma it gives off is actually sweet but with very slight fresh, floral and musk additions. The longer it’s on the body, the more it settles into more of a muted sweetness. 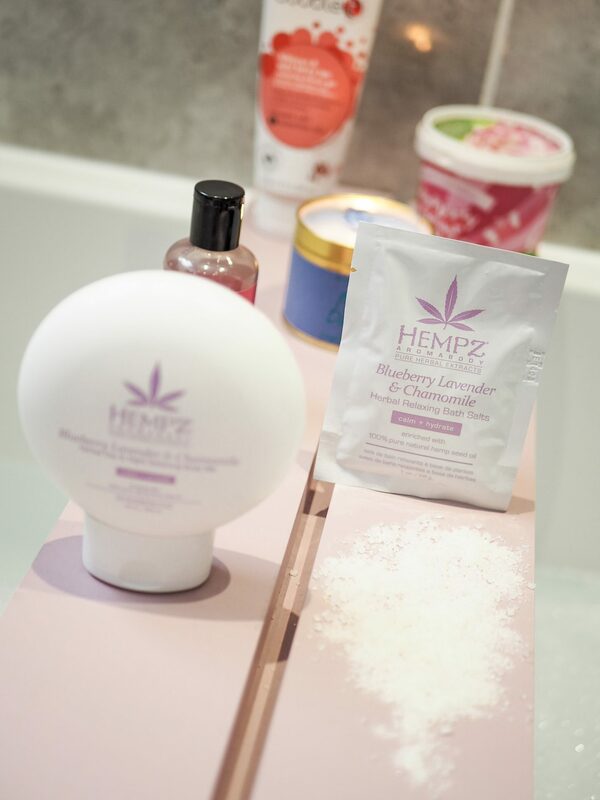 If you’re more into creamy scents, I’d definitely recommend trying the Hempz Milk and Honey range and you can also look at my friend Alice’s thoughts on it here! As for application and performance, I can’t stress how far this product goes. It moisturises so well with such a small amount of product and sinks in so quickly. I find it so difficult to use thicker moisturisers during the day because as weird as it sounds, I feel like it can kind of clog up my pores and make me sweat or feel clammy. This is the perfect inbetween as you get the moisturisation without the heaviness and the scent lasts for a good few hours. Bath salts are one of those products that honestly seem quite boring but actually if they contain the right ingredients they can be so incredibly beneficial for the body. 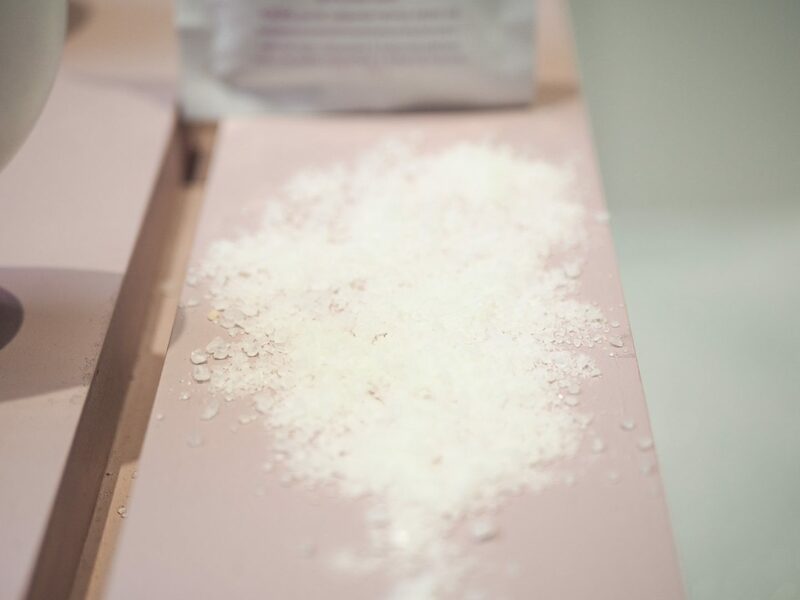 These salts contain magnesium chloride, soaking in products containing the correct amount of magnesium is known to improve bodily functions and reactions, decrease inflammation, improve skin hydration and elevate the process of the healing of any wounds on the body. Some people with chronic illnesses involving inflammation are advised to try bathing in magnesium salts to help their body with fighting the illness. It does say on the box that the packets of salts are single use but if you did want to get a bit more for your money then there’s nothing really stopping you from spreading out the salts between more baths. The packets are pretty well packed, the amount of salt featured in the photo is about half of one packet. The scent of the salts is also really surprisingly strong but I can’t say it stuck around once you put them into the bath unfortunately. I used an entire pack in one bath and it tingled slightly on my skin as I got in. The salts did make me feel really relaxed and quite sleepy after I got out. They were super gentle, didn’t cause any irritation which is great as I have pretty sensitive skin and it was actually really nice to have a calming bath that was enhanced but not overloaded with colour and bubbles. I’d definitely recommend these salts for anyone who needs to relax, struggles with sensitive skin or isn’t too much of a fan of all the added ingredients of bath bombs or the mounds of colours and fragrances. Have you ever tried any products from Hempz? *These products were provided complimentary by Alex Silver PR. "Every Day Things To Get Excited About!" Ooh I love the sound of this brand – I’ve heard a little bit about them but it’s good to read a proper review of their products! I love the shape of that bottle and agree that pots are difficult to get product out of! The bath salts sound great – I’m always coming home with an achy back after sitting at my desk all day and could do with something to relax that isn’t overpowering with fragrances!